170 people from more than 40 countries became Australian citizens in ceremonies across the country on Thursday 9 July, as the nation celebrated Constitution Day, the birthday of Australia's government. Since 1949, more than four million people have chosen to become Australian citizens. 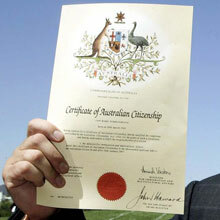 "This year is the 60th anniversary of Australian citizenship, making 2009 an opportunity for us to reflect on the changes that have shaped our nation in the past six decades, and a chance for us to understand the role that citizenship plays in building a strong and unified Australia," Department of Immigration and Citizenship Secretary Andrew Metcalfe said. "On the occasion that marks Australia's creation as a nation, it is fitting to celebrate citizenship, the glue that holds our culturally diverse population together. "Constitution Day ceremonies will give the newest citizens of our nation an opportunity to acknowledge that they understand and respect what it means to be an Australian citizen".